Greetings and salutations, everyone; yes, once again it is I, Mani the purebred border collie, filling in for the guy I live with, and here to bring you up to date on the news from our garden. You may remember me from such posts as “Another Fantastic Week”, among so many, many others. Here I am in a characteristic pose. Nothing like lying in the garden, in the sun, chewing on a pine cone, I say. 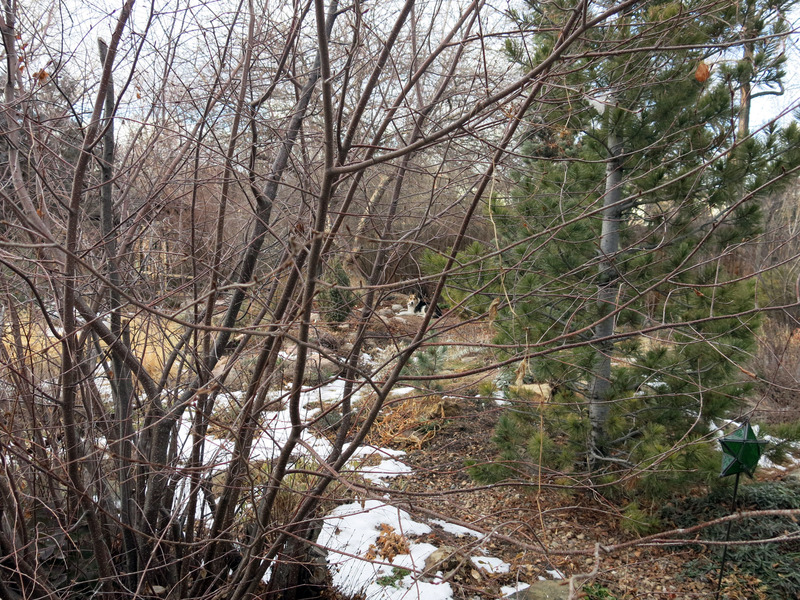 There hasn’t been a whole lot of sun here lately, though as you can see quite a bit of the snow has melted. Yesterday was cold and cloudy. The guy I live with said that clouds were pointless unless they brought rain, drizzle, or mist, but sometimes it’s cloudy without any precipitation at all. “Like last summer”, the guy I live with said. I remember all the complaining. Hardly anything has been happening here, as usual. Well, that’s not quite true. On my walk yesterday I came upon something quite unusual. Unusual for me, that is. The guy I live with said that these were called geese. The same birds that fly overhead all the time, honking like an aerial traffic jam, but this time they were on the ground. 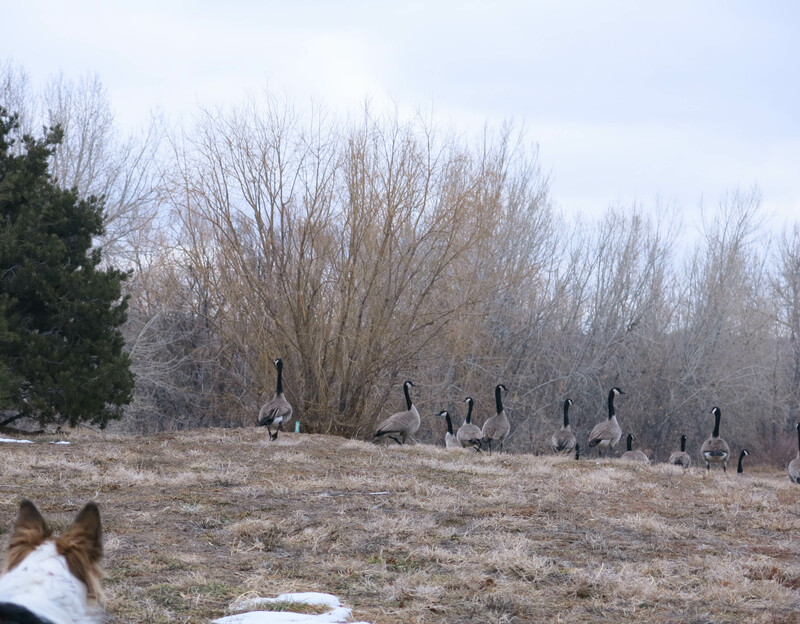 He said that at this time of year there were more geese than people along the Front Range. I don’t know why I never met them before. They were pretty big, as you can see. They’re Canada geese, and they fly down here from up north because our winters are supposedly less cold than where they live. Sometimes you do see them in the summer, here, too. He also said that one of them is called a goose, but more than one are geese. I don’t know how anyone learns to talk, with rules like that. There was also a big hawk in the cottonwood. We see the hawks every day. Maybe you can guess one thing they catch, if you keep reading. 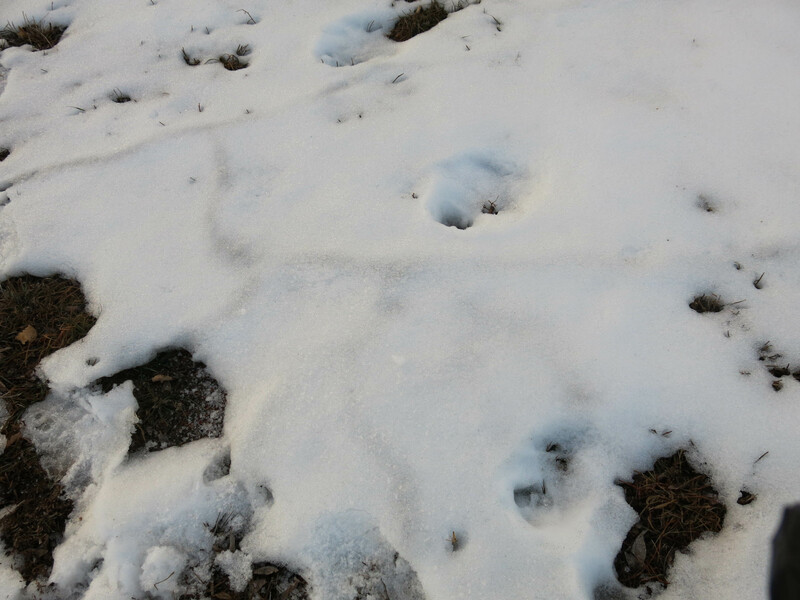 You can see the coyote path I’m walking on. My house is where the path turns to the right, just ahead. I’ve been working on making the path perfect, since the one on the other side of the creek was wrecked by mowing. There was too much mowed grass to be able to find the path again. The hawk flew away before we could get a good picture of it. The hawk must find me terrifying. But you can see it in the tree. 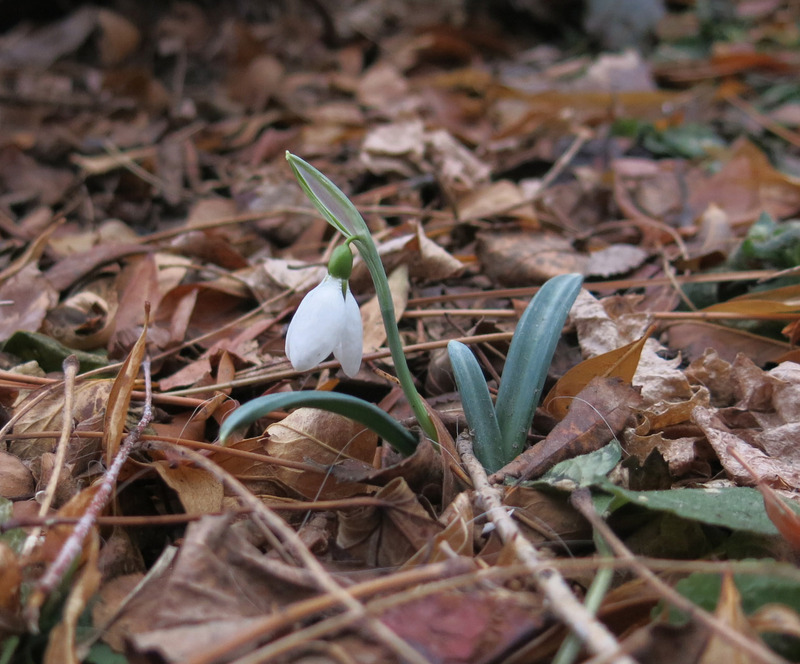 There are snowdrops in flower, and so at least one of us is excited. Snowdrop don’t fully open their flowers unless the temperature is above fifty degrees Fahrenheit, so it’s obvious that it hasn’t been that warm. But still, flowers in the middle of winter are delightful, I hear. 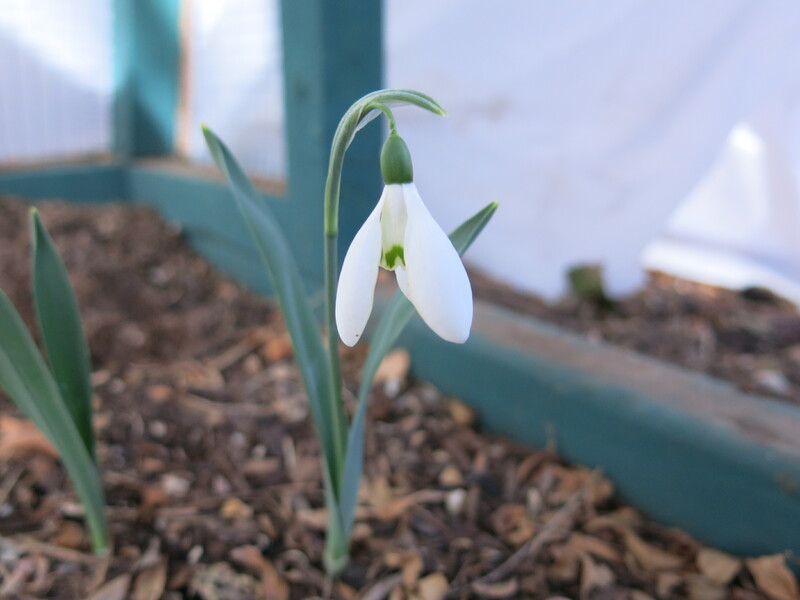 Galanthus plicatus ‘Chequers’ in the Snowdrop Frame. ‘Brigadier Mathias’ in the frame. The last one has a funny little story attached to it. 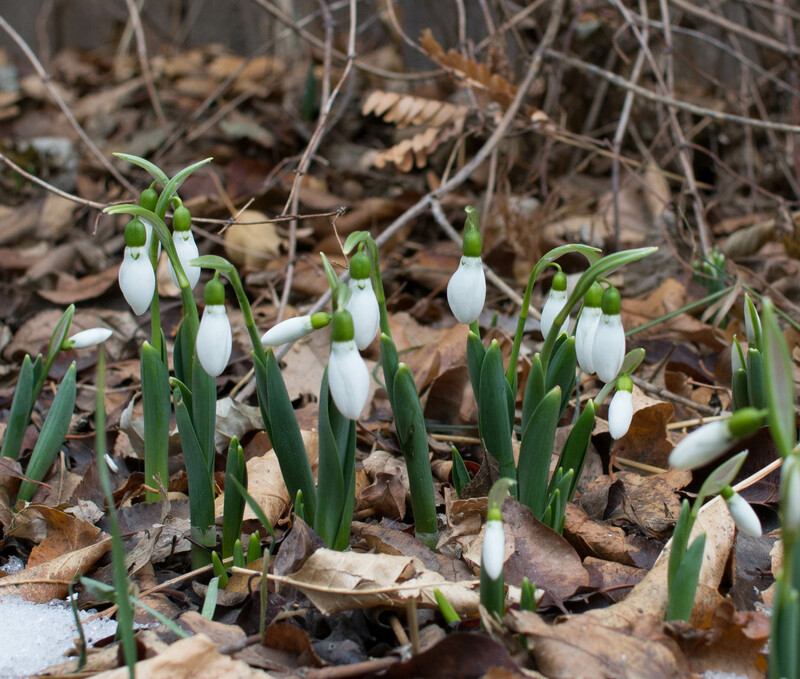 He and his friend got a clump of these bulbs a while back; he persuaded her that snowdrops were excellent, and so they planted most of them in her garden, and a few here. Last year her snowdrops were in flower in the middle of January, and this year they were in full flower on the seventeenth. The guy I live with tried desperately not to be jealous. The soil here is frozen solid; probably because it snowed and then got warm over and over again, and some of the snow melted down into the ground, where it froze the soil. The soil usually doesn’t freeze, or, of it does, it’s just the very top layer. The guy I live with said that during the winter there are creatures called voles that make tunnels and eat plant roots and do all kinds of damage. He said that there were voles in the garden here, years ago, but that Flurry, the first purebred border collie who lived here, really detested them and got rid of them. That’s how he described it. The voles did come back the winter after his wife died and they destroyed a third of what was called The Long Border, and so he decided to take out the remaining plants there and do something entirely different. Then the voles stopped coming, which was fine with him. On one of our walks I saw the tunnels voles made. Tiny little tunnels just under the snow. I looked at the tunnels but didn’t think they were all that interesting. 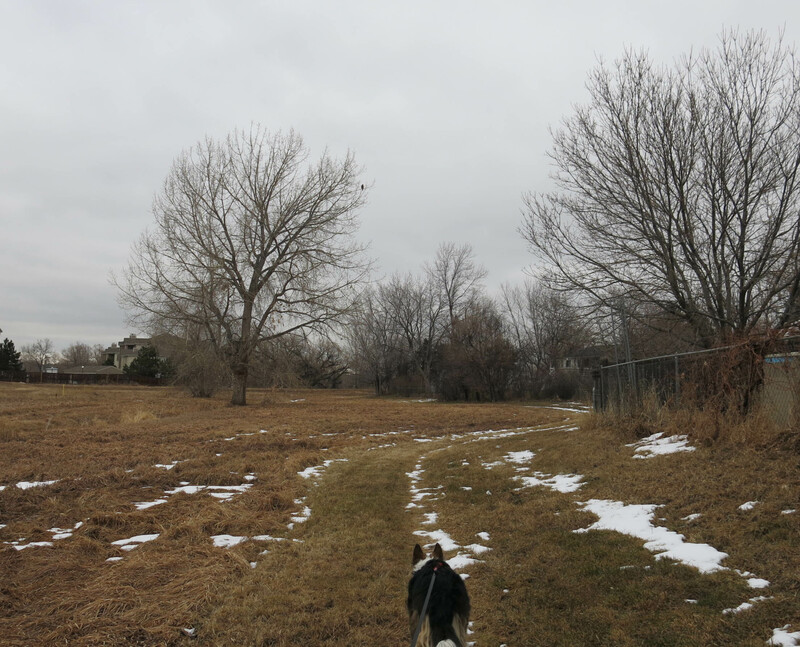 However, the guy I live with bought me a new long leash (because the old one had knots in it) and I quickly learned that I could wander off the path out into the grasses in the field. He said this didn’t make for much of a walk, exercise-wise, but I don’t really need all that much exercise since I get plenty racing around the back yard, monitoring stuff. Anyway, I quickly discovered that when I wandered into the grasses I started hearing things, and smelling things, things I hadn’t heard or smelled before. There are voles in the long grass. So this is kind of what we do now. My walks have turned into vole hunts, and looking for geese. The geese are easier to find. Hunting for voles is really enjoyable. I don’t know what I’ll do if I find a vole, but I have no doubt the guy I live with will say not to do that. 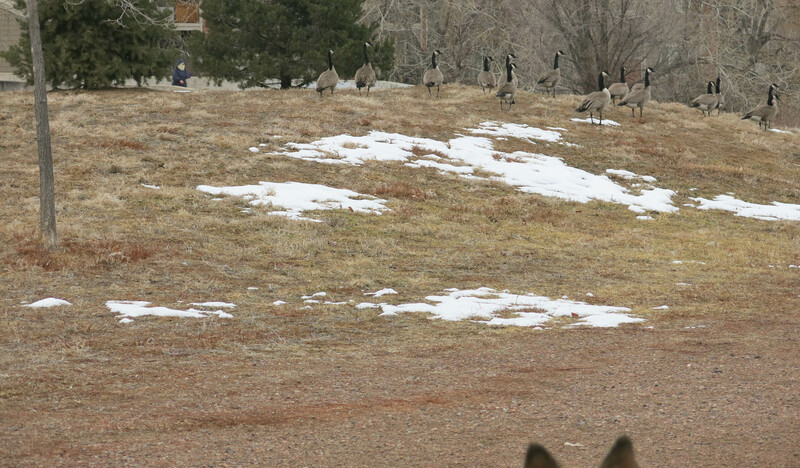 I hope the geese are not too scary, Mani. Do they stay away from you ? They walked away, and then flew off. That was kind of impressive. Gophers are nasty critters too. I just wrote a naughty and insensitive article about them. https://tonytomeo.wordpress.com/2018/01/27/caution/ You might find it amusing, although it does not mention voles. Uh huh. The guy I live with said we don’t have gophers here. Possibly because of the bullsnakes. The guy I live with is kind of batty about them. More in flower today. There’s nothing else in flower here, though. Mani, have I somehow offended? I was right — I no longer receive new-post notification in my email queue. Not to worry, I signed up again, you can’t get rid of me. I mention the change because whatever happened may affect other devoted readers. 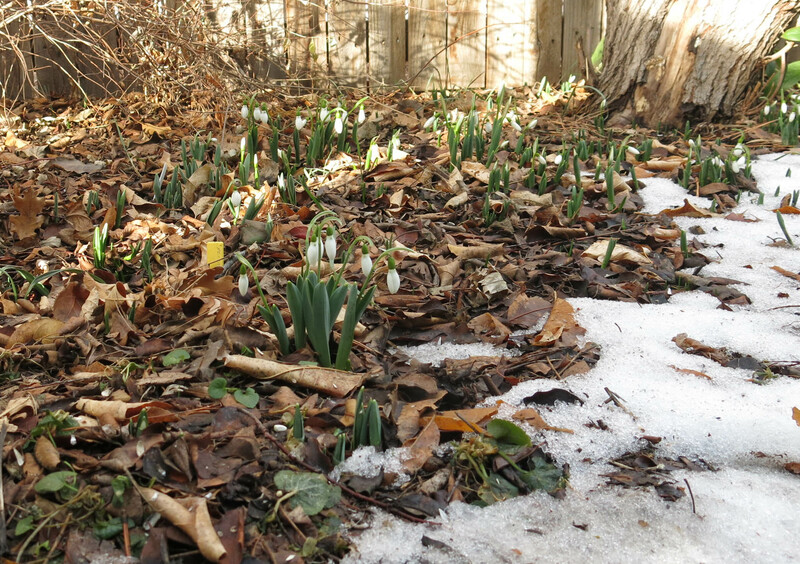 I know they would miss reading about the guy you live with’s snowdrop mania, and seeing photos of the blooms so pretty in patches of melting snow. They would miss the sight of your ears, Mani, at full Goose Alert attention. When we visit my mother-in-law in the high desert, our dogs love licking at dried goose doot. Do not do this. Long leashes, unknotted, allow for lots of sniffing. Our dogs run unleashed at Dog Park, and the young soccer players leave traces of snacks Shredder and Petey glean. Do not do this either. No, the guy I live with says not to eat stuff I find on my walks, especially rabbit poop which can carry clostridium or giardia. Then no Day Care for me. He knows a lot about this sort of thing because Chess got clostridium all the time. From being naughty, of course. Well, the notification thing is interesting. We get an email if you start following and noticed that, and thought it was weird. So we looked. All the followers prior to a certain date have disappeared. That will be fun to try to have fixed. I had something like this happen but it was different. I would comment and comment but there was never any response. I thought I had said something dreadfully offensive to you Mani, but in the end I think I signed up again too. It is kind of weird. Responses are done by email, and as you can tell, I always respond, so each post should have an even number of comments, right? But they don’t always, so something happens. The other different weird thing is how the posts look in Explorer versus Chrome. There’s weird word wrap in Explorer (the posts are done in Chrome). Weird, weird, weird. We prefer normal, and relative equanimity. Awhile back, I too noticed Barb had not received a response from you, Mani, to her comment. I scrutinized her comment and found it inoffensive. Then I thought, hmm, better watch my own comments. Not that I have been inhibited, just so you know. That must have been what happened; it just disappeared. We can log on to WordPress and comment from there,instead of just replying by email, but also noticed that the comment made there never appeared. Must have been a WP thing at the time. And sometimes the email server goes all weird on us. Happy hunting! Could be the vole patrols are part of those expanded responsibilities alluded to on your third birthday. 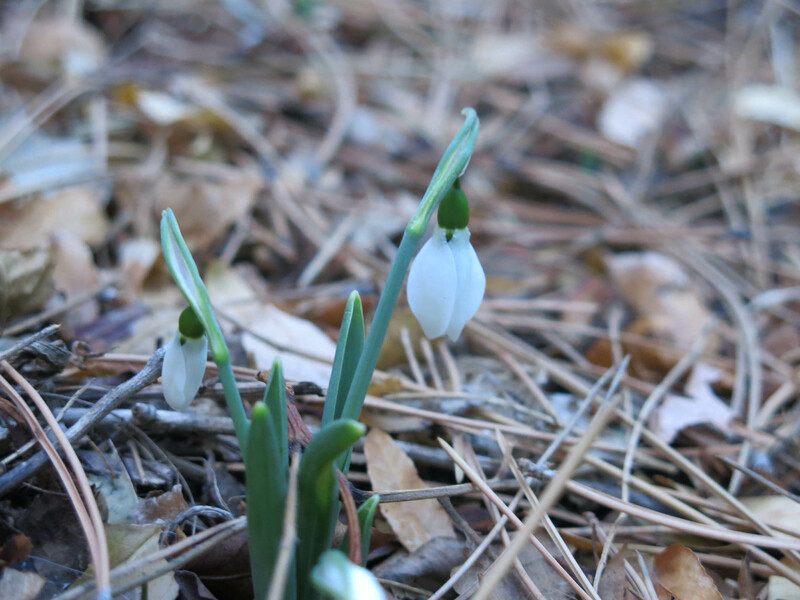 You seem pretty bored by snowdrops, and until a few weeks ago I was just like you. Then I got to thinking about the winter aconites, the first real jolt of color here, and what could keep them company. Thanks to an internet full of pictures, I quickly got to feel unable to go on without some yellow snowdrops. Thankfully, none are available, even if I could afford them, and I’m sure the fever will break soon. 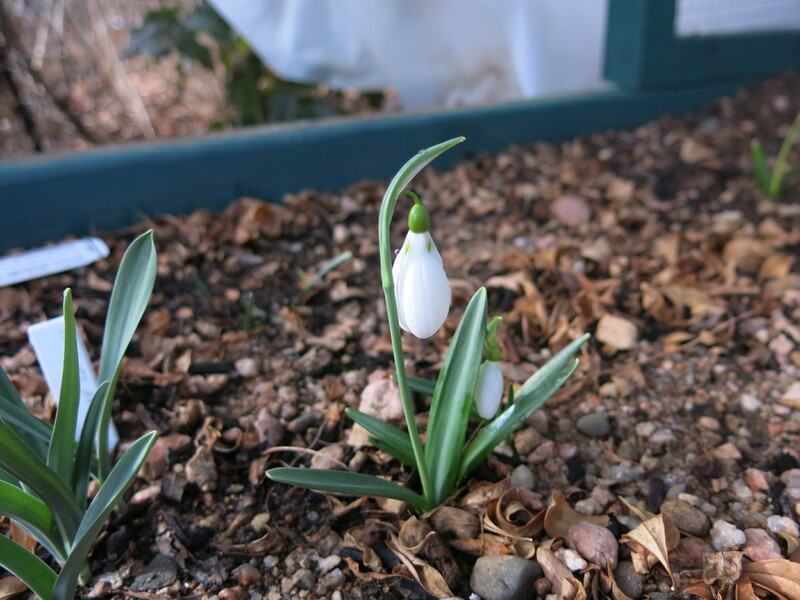 Anyway, the point is that suddenly some day snowdrops might become super interesting. Just so you know. Thanks. The guy I live with believes that there are no voles in the garden, and so I could say that my mere presence is sufficient to ward them off. There used to be some aconites in the garden here, but I think they died out. 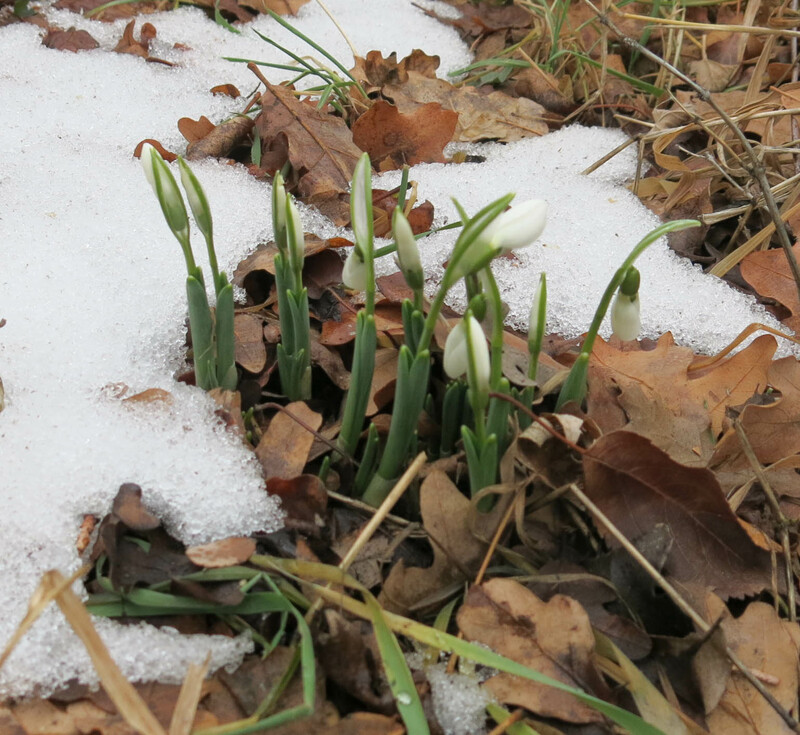 Yes, yellow snowdrops are not easy to find, and there are a few that are even yellower. There are also ones tinged with orange, and with pink. But …. If the fever doesn’t break, I’ll settle for especially green ones. There’s an ideal site: around and among a group of self-sown hybrid hellebores that are all white and green-to-white. The guy I live with says not to look at this site. http://www.dryad-home.co.uk/index.html Or this one. http://www.judyssnowdrops.co.uk/index.html But since they don’t ship overseas it hardly matters. Heavy sigh, huh.